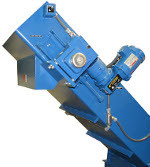 The StingRay Parts Washer Sludge scraper is a highly efficient, low-maintenance, bottom sludge conveyor. The sludge scraper removes sludge, rocks, sand, soil and other solid wastes from the bottom of the parts washer reservoir and deposits the waste into barrels for disposal. A uniquely engineered wiper blade scrapes the front and bottom of each drag bar into the discharge chute to assure minimal carry back into parts washer reservoir. Every detail is carefully designed so the sludge scraper is maintenance free and has a long service life. 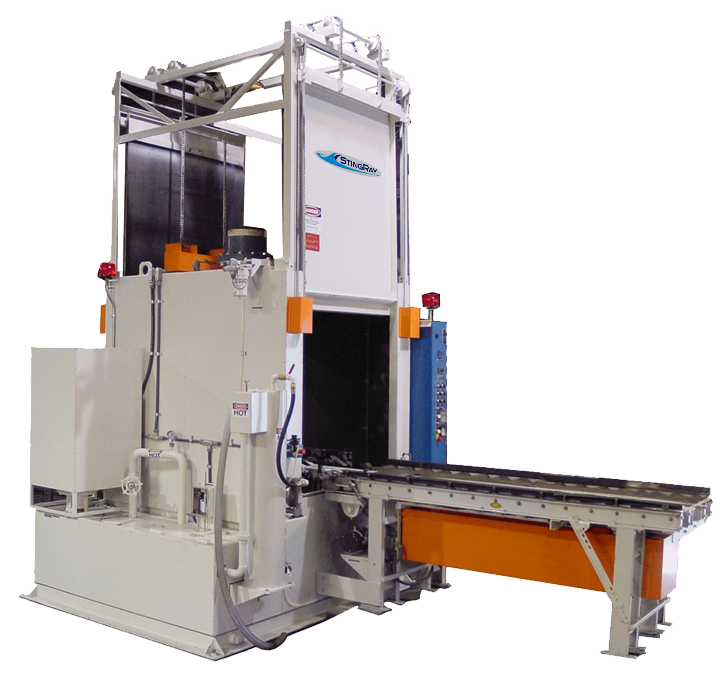 The system provides continuous sludge transportation across the full width of parts washer reservoir bottom. System is suited for use under the harshest conditions involving high heat, moisture and aggressive substances in the hot alkaline environment of the aqueous parts washer. Sludge Scraper consists of heavy weight square Scraper Bars set perpendicular to the discharge chute to drag the full bottom of the Reservoir. Scraper Bars are bolted to a pair of heavy endless chains that travel a loop path around tail and head shafts on sprockets. The reinforced head shaft is driven by a shaft mounted constant Speed TEFC triple Reduction 8000 in-lb torque Gear-motor with Torque Limiter protection to prevent damage in the event of a jam. A forward-reverse control switch is provided to free up Bars if a jam should occur. The fully integrated system forms the base of the parts washer and the discharge chute extends from the cabinet base at a 45-degree angle. As waste is dragged up the incline it is dewatered before discharging into barrels as the wiper blade cleans the front and bottom of each scraper bar. 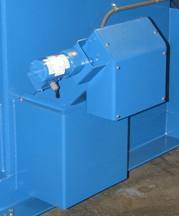 Panel mounted Parts Washer Sludge Scraper controls include “ON”, “OFF” and "AUTO" mode selections. In the “AUTO” mode the scraper operates automatically for an adjustable timed period after the wash cycle. Each new wash cycle starts the scraper for the timed period. Electrical controls conform to ANSI/NFPA -79 and include motor overloads and forward and reverse fused motor starters. The StingRay Airlift System adds the additional function of grease and floating contaminant removal to the parts washer sludge scraper. The Airlift System is the least expensive way of automatically removing floating grease. Removing the grease and other contaminants that float increases the length of the cleaning solution life, reducing clean out costs and improving cleaning. Grease and other floating contaminants are removed by a compressed air-powered circulation system in conjunction with the sludge scraper. The airlift forces floating waste in front of the scraper bars for removal. Circulation of wash solution improves washer heat-up and recovery times by reducing heat transfer resistance. Compressed air released thorough “eductors” creates fluid circulation in the reservoir. Solution is “lifted” from the bottom and moved across the solution surface toward the sludge scraper blades. Floating waste is forced in front of the blades, lifted out of the solution, dragged up the scraper chute and deposited in drums along with the waste hauled off the bottom of the reservoir. System is automatically controlled during scraper operating times and during washer heat-up periods. Connects to factory compressed air. The StingRay compact Mini Surface Scraper collects floating masses of waste, such as grease, cosmoline, crater compound, synthetics, oil and other floating contaminants, from the parts washer solution surface and deposits the waste into a container for disposal. Benefits of mini surface scraper are extended cleaning solution life, lower spent solution disposal costs and consistently better parts cleaning results. Floating contaminants are collected from the solution surface and pulled up the incline chute allowing solution to drain back into Reservoir. Waste is mechanically wiped off the scraper blades into the waste container to maximize removal of waste from solution and minimize carry back to reservoir. Full steel or stainless steel construction, precision engineered for use in the hot alkaline aqueous environment. System is driven by a fractional horsepower TEFC electric gear motor for reliability. Operator controls include a selectable “ON”, “OFF” and “AUTO” control with programmable operating time. Complete scraper is removable for easy access to washer reservoir. 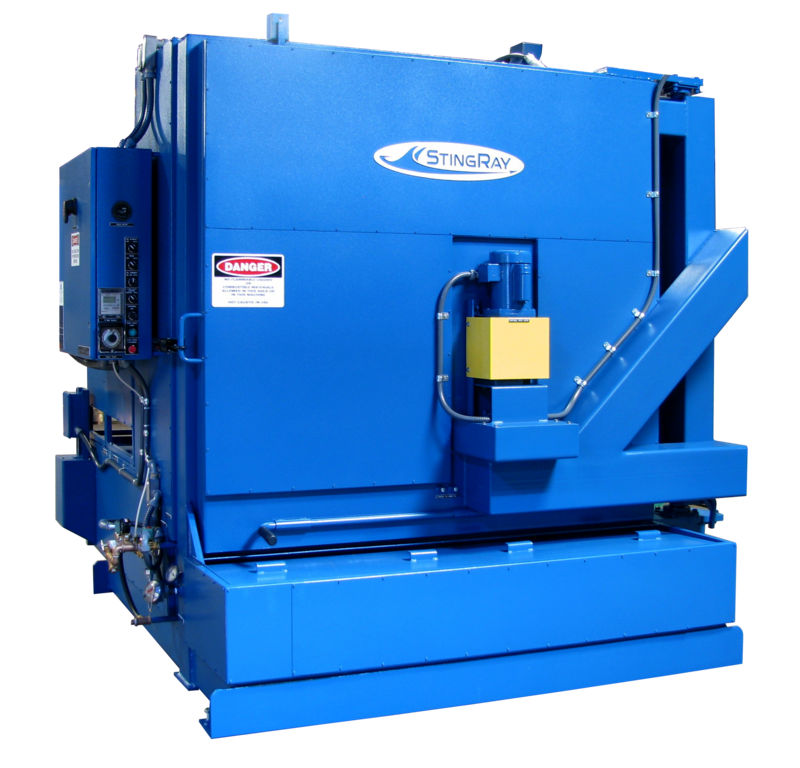 Includes an Air Lift powered by compressed air to direct floating contaminants toward scraper blades. Air-lift automatically controlled during scraper operating times. Connects to factory compressed air supply. The StingRay cleated belt surface scraper collects high volumes of floating waste such as grease, cosmolene, crater compound, synthetics, oil and other floating contaminants, from the parts washer solution surface and deposits the waste into a container for disposal. The system is ideal for bearing washing applications and other high volume grease cleaning applications. Benefits of the cleated belt scraper are extended cleaning solution life, lower spent solution disposal costs and consistently better parts cleaning results. Floating contaminants are collected from the solution surface and pulled up the incline chute allowing solution to drain back into Reservoir and deposited in waste container. Belt scraper is driven by a highly reliable fractional horsepower TEFC electric gear motor. Operator selectable “ON”, “OFF” and “AUTO” control with programmable operating time for ease of use. Scraper pivots on ball bearings to provide access to washer reservoir. Scraper is generally positioned over the pump suction screen so that all floating contaminants naturally move to collection zone during operation.